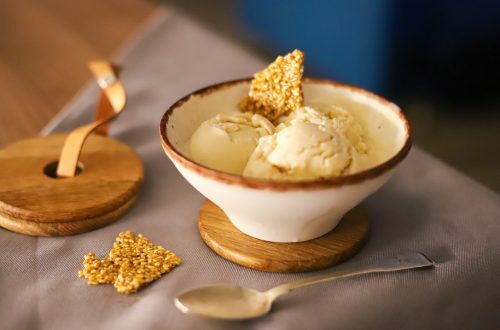 Once you get hold of your Dark Muscovado sugar, you are off to make this exquisite ice cream, which will be your go-to recipe every time you want to impress. 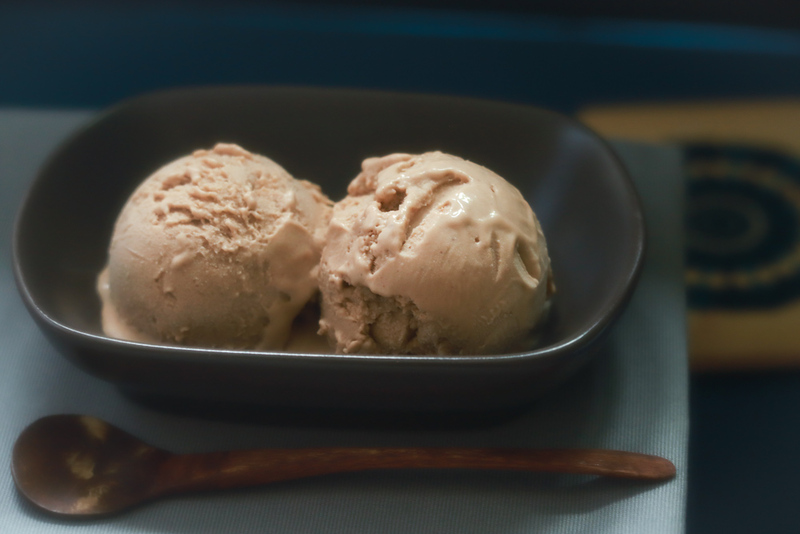 It pairs perfectly with chocolate cake, making it the perfect ice cream for making an ice cream cake. Please note that there is no substitute for dark muscovado sugar. Dark Muscovado sugar is a type of dark brown sugar, which is labelled as “Dark Muscovado Sugar”. The one I use is from the island of Mauritius. As far as I know, it is the traditional methods they use there, which make this sugar so special, so I can only guarantee the taste for the sugar labeled as “Dark Muscovado sugar” of Mauritius origin. This is the one which will give your ice cream a stellar taste. I have no experience of Dark Muscovado sugar of a different origin, so I am unable to recommend any. 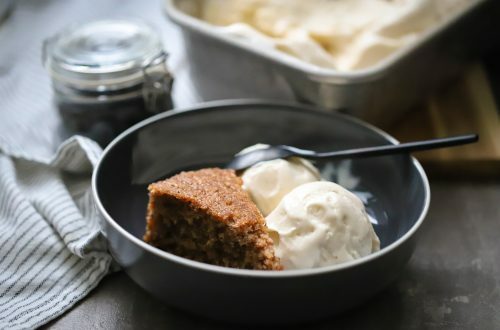 If you wish to use dark muscovado sugar of another origin, the best way to test it is to try a spoonful; if it tastes extraordinary, then chances are that your ice cream will taste extraordinary too. In any case, do not use any sugar labeled simply as “Dark Brown Sugar”, as it is NOT a suitable substitute for this recipe. This batch is for an ice cream maker of 1.5 litre/quart capacity. If your muscovado sugar has hardened during storage, it is advisable to soften it first. Start by measuring the quantity you need to use and put it in a container with two slices of apple for a few hours (no need to peel). Close tightly with a lid and let it soften; the sugar will absorb the apple’s moisture and become soft again. If you have a microwave oven, you can quickly soften it there; place in a microwave-safe bowl, covered with a wet paper towel and a plate and heat for 40 seconds on medium power (approx. 450 Watts) checking if it has softened and then in 10-sec bursts, if needed, till softened. Start by preparing the Muscovado Sugar: put it in a bowl and start massaging it with your fingertips. Your aim is to find as many lumps as possible and rub them with your fingers to dissolve them. Do your best and enjoy the procedure. Pour the heavy cream in a large bowl with a mesh strainer on top and set aside. Place the egg yolks in a medium bowl, whisk them lightly and keep the whisk nearby. Also place a ladle next to the bowl, to have it handy. Place milk, Dark Muscovado sugar and a pinch of salt in a medium saucepan and place over medium heat, stirring often with a silicone spatula until the milk begins to steam and the sugar dissolves. You want to use a silicone spatula that will scrape the bottom of the saucepan as you go. This is crucial for the next step. Remove the saucepan from the stove and using the ladle take a ladleful of the hot milk with one hand and start pouring it slowly into the lightly beaten eggs, while whisking them with your other hand. You may keep the bowl from sliding about by placing it on a wet tea-towel. Repeat the process with 2-3 more ladlefuls. Pour the egg-yolk mixture back into the saucepan. Over medium heat, continue stirring the milk mixture with the silicone spatula, scraping the bottom of the saucepan as you go, till the moment it starts to thicken (an instant-read thermometer, will register 79º C – 82º C / 174º F -180º F ). If it gets much warmer, you will end up with cooked eggs. Immediately pour over the mesh strainer and into the heavy cream. This is your ice cream mixture. Now you have to cool it down before putting it in the fridge. Make an ice bath (by taking a large bowl that can accommodate the one with your ice cream mixture and put a handful or two of ice cubes and cold water in the middle of the bowl). Now carefully place the other bowl on top. Give it a stir from time to time to help it cool down faster. 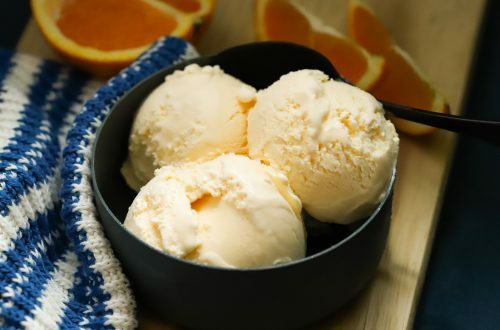 When it feels lukewarm to the touch, remove the ice cream bowl from the ice bath, wipe it well from the outside to remove any excess water and pour it in an airtight container. Pour over the coffee liqueur ( if using ) and give it a stir. Place in the refrigerator and leave overnight to cool completely. You can leave it in the refrigerator up to 3 days, depending on the freshness of the dairy products you used. Prepare the ice cream machine according to the manufacturer’s instructions. With the machine running, pour the chilled ice cream base through the canister and into the ice cream machine. Leave to churn until nice and fluffy. With the machine still on, add the coffee liqueur, if using. Allow to churn for a full 5 minutes more to properly mix in. Remove the machine from the container and put the container along with the lid into the freezer. Leave for 3-4 hours for the ice cream to properly set, before serving or removing to another container to store.